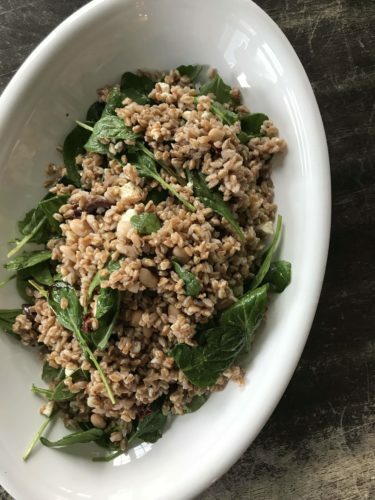 Farro is an ancient grain with a beautifully nutty flavor and chewy texture. The flavors of the Mediterranean are known to promote heart health and weight loss. Here they are wrapped up in a delicious salad. 1. Stir farro, water and 1 tsp salt in the inner pot. 2. Cover and lock the lid in place. Set to pressure cook (high) for 25 minutes. Use quick release method and remove lid. 3. Pour into a colander to rinse and drain then transfer to a large bowl. 4. Add remained ¼ tsp salt, pepper, olive oil, vinegar, beans, sun dried tomato, onion, feta, olives and spinach to the bowl and toss gently. 5. Serve at room temperature and store leftovers in the refrigerator for up to 5 days.